I want to dedicate this drasha to the memory of my aunt, Miriam bat Reb Zvi (Fleisher) z"l, who died peacefully a few days ago at the age of 90. After escaping Europe at the beginning of World War Two, she made her way to North Africa and eventually to the States. She was there to receive my father (may he be blessed with many more years of good health and happiness) when he arrived after the Shoah, and to help him start a new life. May her memory be blessed. I would also like to dedicate it to the memory of my beloved father-in-law, R. Leibush ben Moshe Shmiel, a Holocaust survivor who passed away on 17 Shvat [early Monday morning in Israel]. He was a dedicated Jew who did everything for his family, and was rewarded with much Jewish nachas from his children, grandchildren, and great-grandchildren, who are all observant Jews, and most of which live in Eretz Yisrael, where he spent his final years. Yehi zichro Baruch -- may his memory be for a blessing! Receiving the Torah in our parsha is of course a peak prophetic experience for Am Yisrael. Amongst the descriptions of this experience is that Am Yisrael were seeing the voices. In this context, the Degel Machaneh Ephraim quotes an astounding allegory from his grandfather, the holy Baal Shem Tov. There was once a musician who played such beautiful music that those who heard him were unable to restrain themselves, and they danced almost to the ceiling due to the great pleasure and sweetness. Anyone who passed by would stop to listen and then also join in the ecstatic dance. A deaf person passed by who could not hear the music; he just saw people dancing wildly, and he thought they were insane. Had he been wise he would have realized that they were dancing to beautiful music and he would have also joined in. 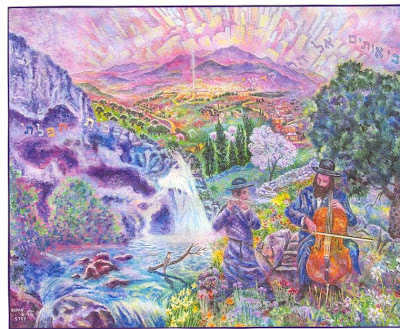 The Degel Machaneh Ephraim explains his grandfather's story to mean that the angels, who were unable to hear Hashem's voice addressing the Jewish people at Mount Sinai, nonetheless saw the ecstatic bliss of the people and approached, attempting to also enjoy the great sweetness and pleasure of the Torah. In this we have an advantage over the angels, as Hashem is talking to us! When you hear the Ten Commandments being read this Shabbat morning, close you eyes and try to visualize the letters and words as you hear them. Hashem is revealing His holy Torah to you – let yourself dance to the beautiful music! Shemot 20:15. See our Redemptions, pp. 104-5. This is of course a major theme in the Piaseczner Rebbe's plan for secret groups of Chassidic mystics who used dance as well as other techniques in order to try to receive prophecy. His Bnei Machshava Tova groups were modeled explicitly upon the Biblical Bnei HaNeviim. See our dissertation, Between Messianism and Prophecy the chapters on Chassidism as prophecy and on spiritual groups. On dance as a mystical technique see pp. 81-83, especially notes 262, 263.